just to confirm August Forster grand (190/215) is my no.1 piano after playing 90% of the list from the Pianobook (first 3 tiers). someday ill be getting one. 30k is a no brainer price. Go for it! So many of us have been in your situation. And have started with one budget and enlarged it immensely as our shopping educated us and we grew more wise. 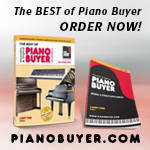 And why wait to get the piano of your dreams when it is out there just beyond reach? I started with a $10,000 budget. Had saved that for years. But then, my ears and fingers told me differently! Lots of good advice here. And used will get you so much more. Can't wait for more details of your search. Happy MH owner with no shoes and no clothes but a nice piano! Normally a Foerster 190 is much, much more expensive than an Estonia 190. And I would say here in the USA probably would normally be perhaps 30% more than a Schimmel K189T. Normally. If you can get a Foerster 190 for anywhere near what you have indicated - you are very fortunate. You are right in that she is lucky to find a new Forster 190 at that price. However, I think you misundertood the intent of the rest of my post. I was NOT implying that August Forsters are as inexpensive as Estonias. (They aren't.) I was simply stating that, compared to so many other premium makes like Steinway, Faziolli, Grotrian, Sauter, Bechstein, Bosendorfer, Bluthner and Steingraeber, Forsters are arguably of equal quality but cost less. In that way August Forster could be considered a "value" make. As a matter of fact, in the 85-90" length range, the Forster 215 grand was not only cheaper the than the competing models of the makes listed above, but also undercut (ever so slightly) the competing Schimmel Konzert and Shigeru Kawai models as well. And how did you like the AF 215 if I may ask? Both the AF 190 and 215 models are on our "to audition" list when we go to New York in 3 weeks. I've heard nothing but praise for them from others. My niece will be auditioning other makes of pianos as well, but I hope she takes a liking to some of the less expensive makes like Estonia, Charles Walter, Schimmel, Shigeru Kawai, Mason & Hamlin, or August Forster. Have any of you other bloggers experienced this problem with the "Blue Book of Pianos"? Are the Blue Book prices too high or too low? 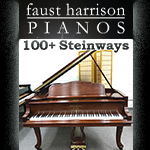 Based on my experience as a university piano faculty member, I can say that the prices on the bluebookofpianos.com site bear NO resemblance to the prices we've been quoted as an institutional buyer on pianos from Steinway, Yamaha, Kawai, Estonia, Schimmel, Mason & Hamlin, and Bechstein. For that matter, what is the purpose of publishing an "institutional" price in a consumer publication, since a typical retail buyer won't be able to purchase at that price? Well, terminaldegree, I assumed that if the Piano Buyer's "Suggested Maximum Price" was a price above which a consumer should never accept, the Bluebook of Piano's "Invoice Selling Price" was a price below which a retailer should never accept. Thus the closer the consumer and retailer could get to the "Invoice Selling Price", the better the "deal" for the consumer. However, most people on this site question the accuracy of the prices quoted in "Blue Book", so the point is moot. But my original question remains - are the "Blue Book" prices lower or higher than the actual retailer's cost of the piano? The Blue Book is a private, "unauthorized" publication of retail prices which are NOT supported or updated by manufacturers in a transparent, reliable way. I have contacted Blue Book several times myself to pint out some errors, however they chose not to reply. As a result, BB only transpires to confuse even more what is for many an already confusing market. The most reliable, regularly updated data about pricing are published semi-annually by Piano Buyer which is based on the actual prices supplied by manufacturers themselves. Last edited by Norbert; 04/23/13 09:37 PM. Funny that you should say this . . . August Forster changed my world today. And probably ruined it. The 190, never had an owner, but is about three years old. Thoughts? I told him 30k was my max, he said he could come near it. I cried playing this piano. I cried listening to him play this piano. I'm currently looking around my house for things to sell. 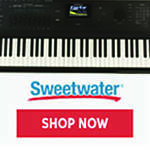 Why would a retailer sell a piano below cost?? I have a new Kawai K8 scheduled for delivery tomorrow. So having recently shopped for a piano I can somewhat relate to what you're going through. Although, I was in the market for a vertical not a grand as my wife wasn't willing to let my piano habit occupy that much space. I started my quest thinking I'd buy a used vertical, a Yamaha probably out of Craigslist for about $3K. But first I thought I'd visit a few shops. The first one had used Yamahas, Kawais, Petrofs etc. All within 10 to 15 years old. Good quality but nothing inspirational. Then I visited a Kawai dealer -- and they had a new K8 - which I loved instantly. Search over, however, the sales guy barely spoke English - which made negotiating a bit unwieldly. Apparently they catered mostly to the Asian market. So I made a rather long trek to another Kawai dealer - who as luck would haven't didn't have any in stock to try. The owner was absolutely super great guy - but he said that very few people want to buy a new top of the line vertical. OK, I said, but does Kawai have distribution nearby from which you could drop ship to my house? Yes. (Los Angeles area) Great, what's the best deal you can give me considering you have no inventory carrying costs and you don't have to touch the piano? After doing some calculation in his office he comes back to me with $10,500. At which point I should have counter offered but since I'm not all that good at this, I accepted the deal. So I started at $3K and wound up at $12.5K - yes sales tax is a whopping 10% in the land of fruits and nuts. My rationalization for such extravagance? 1) I spend a minimum of an hour a day during the week and 2-3 a day on the weekends. 2) This is likely to be the first and last piano I'm ever going to buy, at least in this life 3) The piano is very very important to me - not because I'm any good it's just the way it is. (BTW my other "piano" is a digital Yamaha hooked up to the Synthology virtual version of a Steinway concert grand). So this is a long winded way of saying get whatever piano your ears, hands and heart desire. As for my purchasing strategy - I'm sure it left a lot to be desired, my piano buying experience up to this point was precisely zero. But at the end of the day what really matters is that you get the piano you love. If I've accomplished this, that is all that matters. In that case, maybe it would be a good idea over here in the piano forum to do what the digital forum folks have done: A sticky thread of actual prices paid. August Foerster is a very fine piano comparing to world's absolute best. I was in factory few years ago and couldn't believe how much handworking goes into these pianos. If you can get one of them anywhere near the price you indicated you are very lucky. Can assure you they cost a lot more wholesale. I was in your spot about a year ago. I went out and played as many pianos as I could, over the period of about 5-6 months. I would suggest that you play all brands and sizes. Play the most expensive one in the store, and see if it sounds TO YOU, like the best one in the store. Often times, it won't! You also want to like and trust the store/sales person. You will be working with them even after the purchase, and you want to make sure that you trust that they will be able to stand behind the piano. After months of trying out different pianos, I narrowed it down to Mason and Hamlin, or Shigeru Kawai. In both of those, I found the 7 foot size to be my sweet spot (well, I never considered 9 foot for the size of my room!). When I jumped to that size, it just felt like I was getting so much more piano. I bought my Shigeru Kawai (SK6) last October and I just love it. My only complaint is that I don't get as much time as I would like to play it! See if you can find a Shigeru Kawai in your area to try out. Good luck!! Congrats on your new piano and your search! Enjoy many days of happy playing! I was simply trying to arrive at what it cost the dealer to buy the piano in the first place. It would put the consumer in a better bargaining position if he or she knew the wholesale price of the instrument in question. I agree with all of the others. You can't trust the Blue Book and it is all over the place with its "quotes." It's much easier to bash a Steinway than it is to play one. I have sent you a PM. When I started my piano search, I tried most of the best European pianos, the Steinways, Mason-Hamlins, some Japanese and Korea pianos, etc. 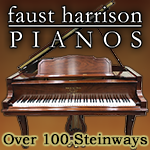 There are so many fine pianos out there, and many differences, so try as many as you can before you decide. You will also want to consider slightly-used or rebuilt instruments. Prices might surprise you on some of the slightly-used. If you choose one of these, you will hear from most of us here that you should have it checked by a tuner/tech. The cost is not a lot and it can really save you a lot of troubles. Good luck and let us know what you decide! The logic in this fails quickly. Even when you see the factory invoice of a car, you don't see backside payments for volume and customer satisfaction reports. It only seems transparent. I don't know the invoice price of any article of clothing or piece of furniture I own. I certainly don't know the cost of many services I purchase. Nor to I know what is typical margin in those industries. I'd have to search for the thread, but somewhere Steve Cohen posted more thoroughly about the music industry vs. other industry margins showing them significantly below average. Invoice doesn't account for retail costs that vary. Say the cost of a Manhattan store vs. one in the suburbs of Atlanta. The phenomena of the group buy is almost exclusively for Yam U1. How many Bösendorfer pianos would you like to buy? I feel sure I could get you a volume discount at about 10-12.